Clifford Hanson in action for Dreams FC. Dreams FC striker Clifford Hanson to Spanish Segunda side Extremadura on a six-month loan deal. But Extremadura have the option to make the deal permanent if they are impressed. Hanson came from feeder club In God We Trust FC and got promoted to the First Team in 2017. 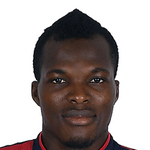 Last season, he was on loan at Division One League side Agbozume Weavers FC. According to a footballmadeinghana report, Hanson can operate as a the lead striker and as a winger.